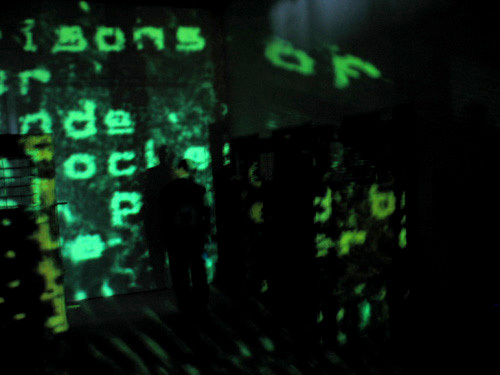 This work captures the viewer moving through space with a live camera, with their image projected in particles that is stored in memory and appear later as a ghost. The person passing by also activates text. The ambient sounds are a composition of data derived from manipulating live biological cells. The piece was originally conceived site specifically for an exhibition held at the former Seodaemun prison in Seoul, Korea. Prisons of our minds unlocked by the power of love. Ghosts of suffering from the past haunt these spaces now. Waiting for the key to open the door to the future. Bars of steal dissolved by the heart.